Let’s take a look at Sailor Jentle Tokiwa-matsu, aka Pine Green. I was so sad to hear that Sailor Jentle inks will be moving from the standard 50ml bottle to the smaller 20ml bottle. There are a few 50ml bottles available, but not many. I was able to find some at Goldspot Pens, but I’ve had my bottle for a few years. If this color interests you, I would suggest snagging some before all of the 50ml bottles sell out. Tokiwa-matsu is a medium olive green. In large swabs you can see the dark red sheen. Other properties: no shading, high sheen, and no shimmer. On Staples 24 lb copy paper there was feathering and bleeding in most nib sizes, so it’s not an ink I would recommend for cheap paper. I did not see any sheen on this cheap paper. Tokiwa-matsu and Epinard are vey close. In writing, I’m unable to tell them apart. 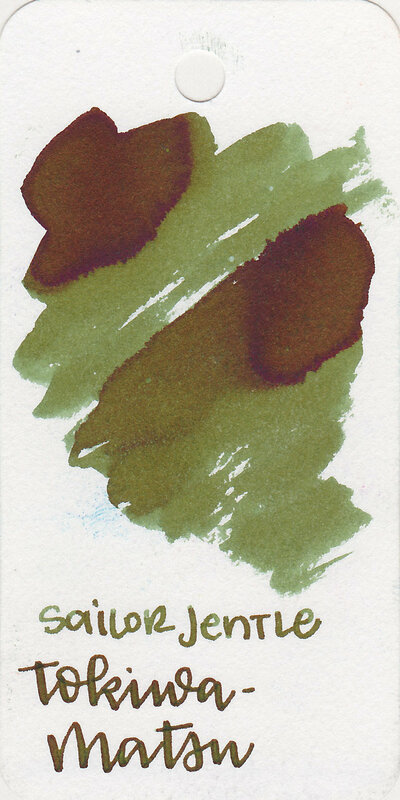 Other similar inks are Platinum Classic Forest Black and Birmingham Arugula. Click here to see the sailor inks together, and click here to see the green inks together. I used a Pelikan M805 Ocean Swirl with a broad nib on Tomoe River paper. The ink has a wetter than average flow. Overall, it’s another great ink from Sailor. It’s very similar to Sailor Jentle Epinard, so I would suggest getting one or the other, you probably don’t need both.